...or is it Santa's Belly? Welcome to the final NTT for 2018 friends! 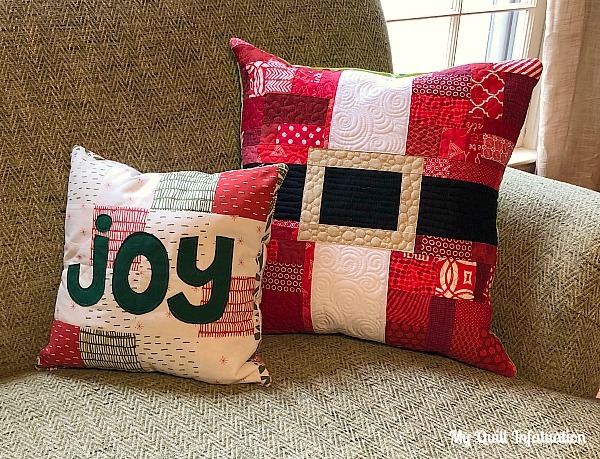 Pillows are such a fun way to get some instant quilty gratification, and at this time of year we all need a little of that. I love that this pillow is clearly Santa without being a picture of him. It is just a little different, and that makes it really neat. I realized the other day that of all of the Christmas pillows I've ever made I've never kept one for myself, and I decided that it was time for that trend to end. I had so much fun with this whimsical Santa Belly pillow, and it went together pretty quickly. The color variation in the red scrappy improv adds lots of depth to Santa's suit and I love the metallic gold belt buckle, but my favorite part might be how the different quilting motifs work together to bring each part to life. The swirls in the white give the illusion of fur, and the straight lines and pebbling in the belt add so much dimension. 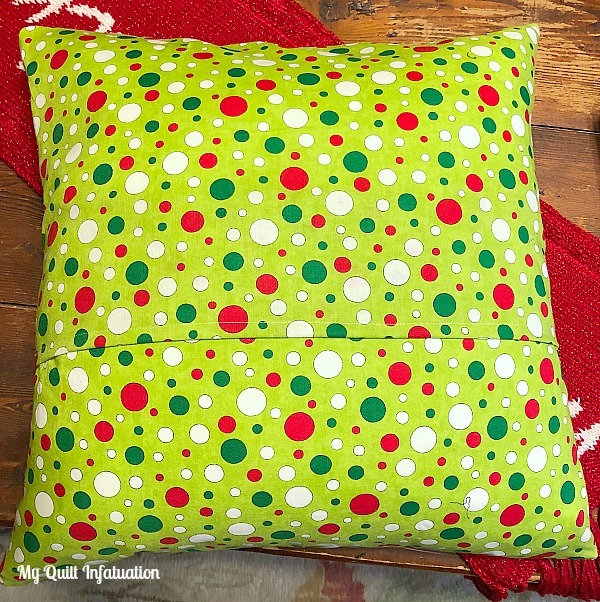 On the back of the pillow, I opted for this multicolored polkadot, and I think it fits the fun and whimsical vibe nicely. I didn't want to frame this pillow with a binding, so I just turned it right side out to keep it simple. This finished pillow is 18 inches square, and I put together a little graphic for you in case you'd like to whip one up for yourself! The measurements listed are finished sizes, so don't forget to add your seam allowances. I sewed the red sections of my pillow using the improv methods from my book Stash Statement, and it's so much easier than you might think! 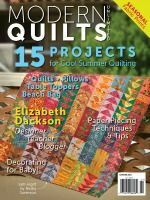 You can get your signed copy in my Etsy shop HERE, or on Amazon, Connecting Threads, or even at your local quilt shop. 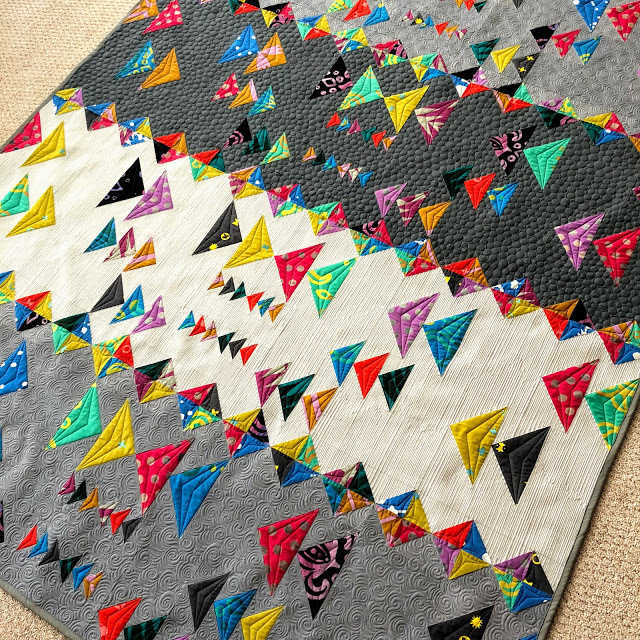 This scrappy string quilt by Elana at That Fabric Feeling is so cute! 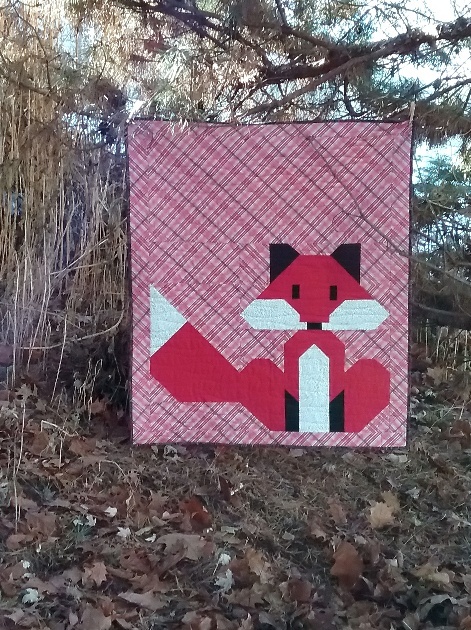 and this Foxy quilt by Kris at Sew Sunshine is absolutely adorable. Y'all rock! 2018 is really going out with a bang! Remember, NTT will be taking a vacation next week, but we will party again in the new year on January 2nd. Merry Christmas and Happy Holidays to you! 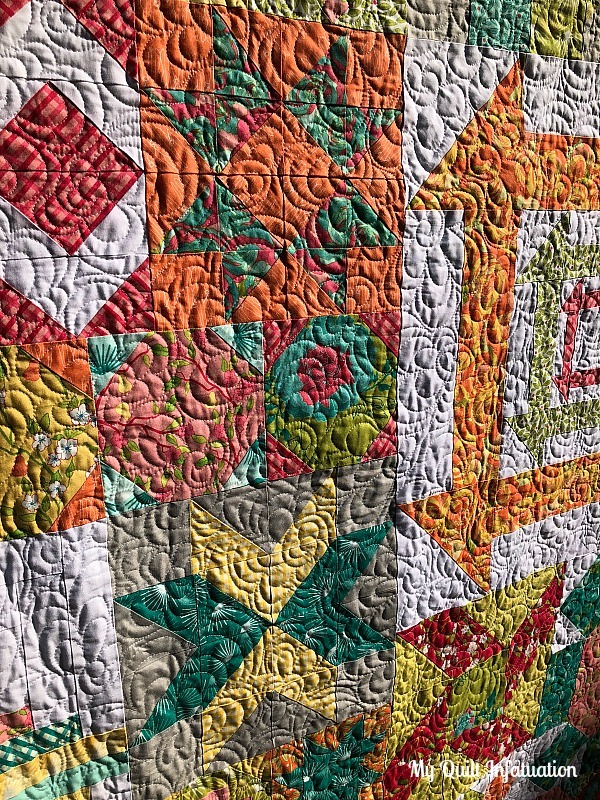 As hard as it is to believe, we've been quilting along on our Classic Meets Modern quilts for a full twelve months, and it's time to close this baby out. 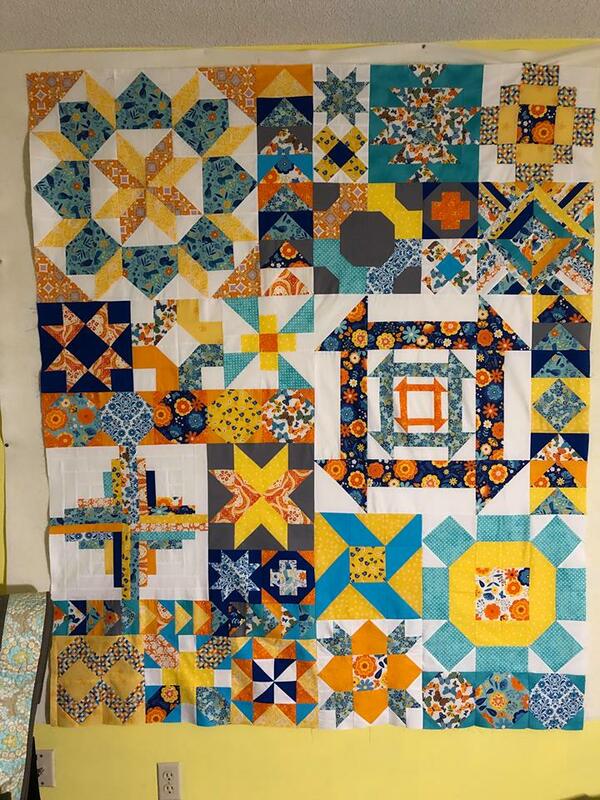 If you've kept up, all of the blocks are finished and now they just have to be put together. Easy peasy! I just couldn't help myself. 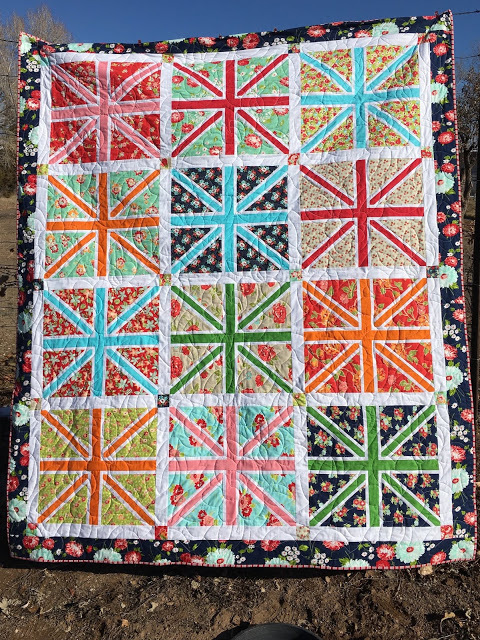 I actually finished my quilt right after putting my filler blocks together back in November. I'm so glad I did since I am still on doctor's orders to rest my neck. 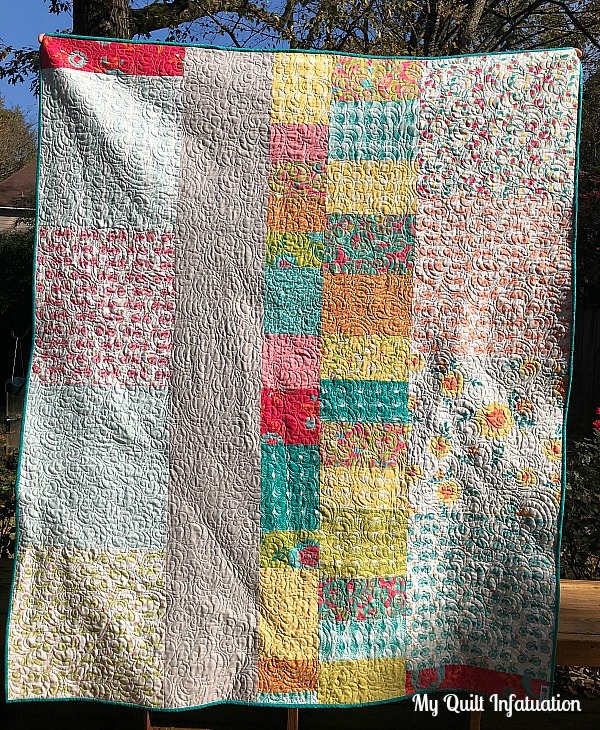 I absolutely LOVE how this quilt turned out with the pretty Acreage fabric collection, so different from my original version in bold solids. I quilted this one with an allover floral pattern with my favorite 50 wt. Aurifil White, and I think the motif works so well with these prints. 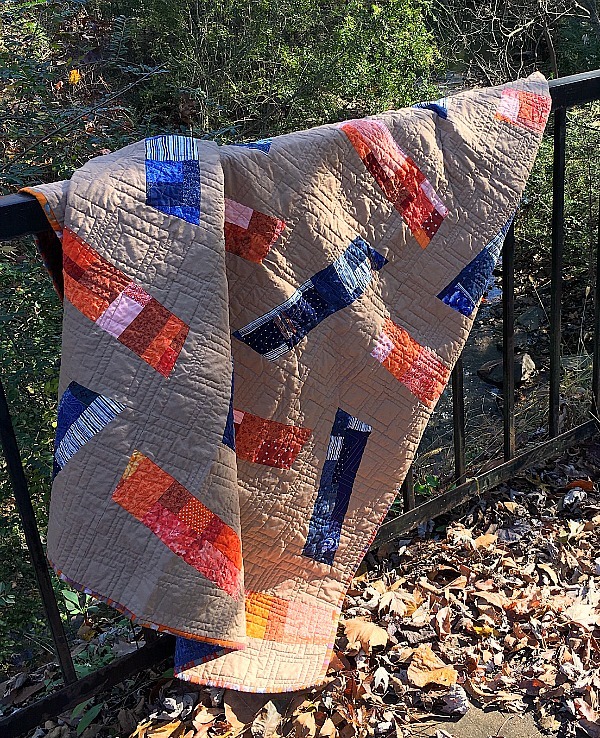 The sun was casting some major shadows during my photo session which really highlights the quilting texture. The bundle of fabric I used was larger than I needed for the blocks and included lots of low volume fabrics. A low volume backing is a bit of a different choice for me, but I simply couldn't bear to leave them out. These softer fabrics paired with a strip of bold scraps and solid gray work really well, and though it is a different kind of backing for me, I really like it a lot. For the binding, I pulled this print from my stash. It's the perfect shade of teal. It isn't from the Acreage collection, but it definitely looks right at home! I think my favorite part of this quilt is how the prints give the pattern such a different look. 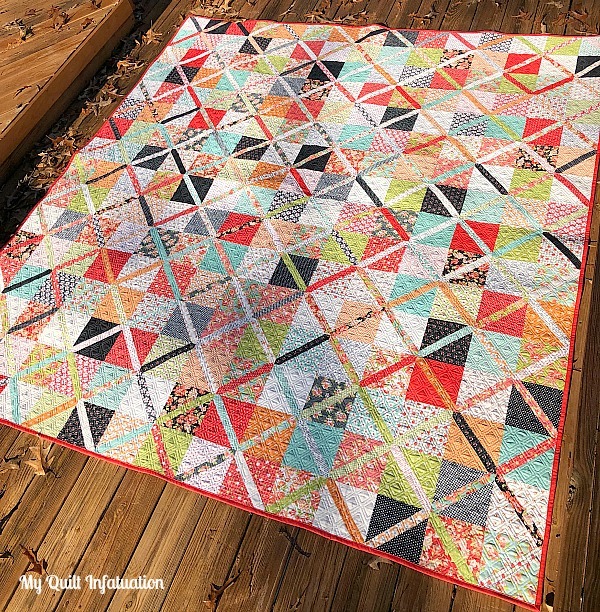 In fact, seeing the pattern interpreted in so many ways throughout the year has been my favorite part of hosting this QAL, and I can't wait to see everyone's quilt tops put together. Remember, there are a few prizes up for grabs! 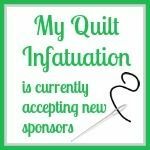 To be eligible for the prize drawings, you just have to have a completed quilt top before the linky closes, and because the holidays are SO busy, I'm going to keep it open until January 15th! 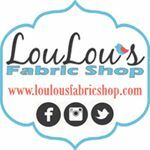 You can link from a blog, Flickr, or Instagram, or if you don't have any of those platforms, you can email a photo of your completed top to me, and I will add your photo to my post and enter for you. Okay! 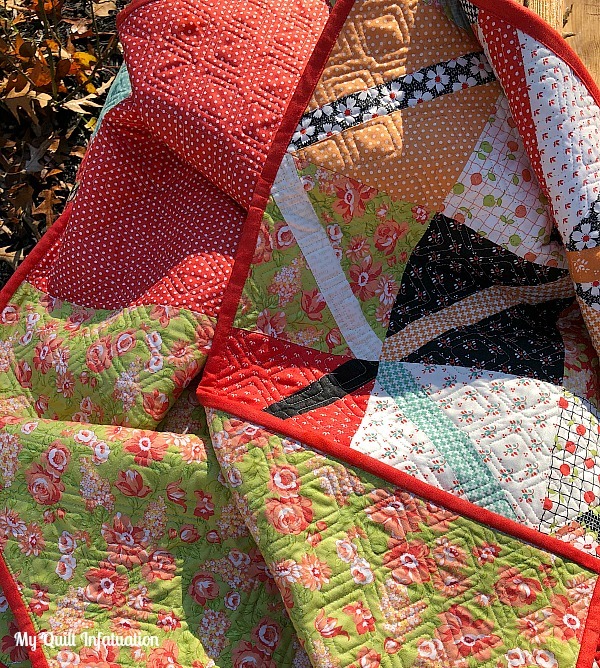 You've spent an entire year putting your quilt together, and it's finally time to show off your hard work! 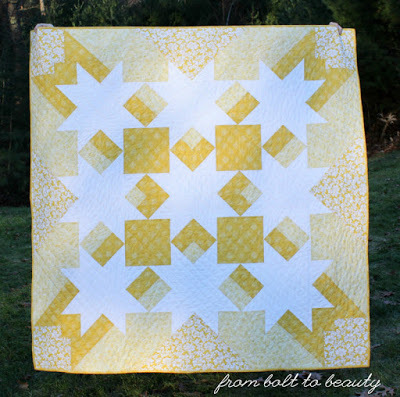 Remember, this link up is only for sharing Classic Meets Modern quilts. 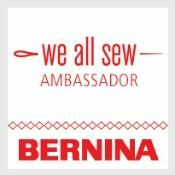 You can link up all of your other awesome finishes at the next Needle and Thread Thursday. 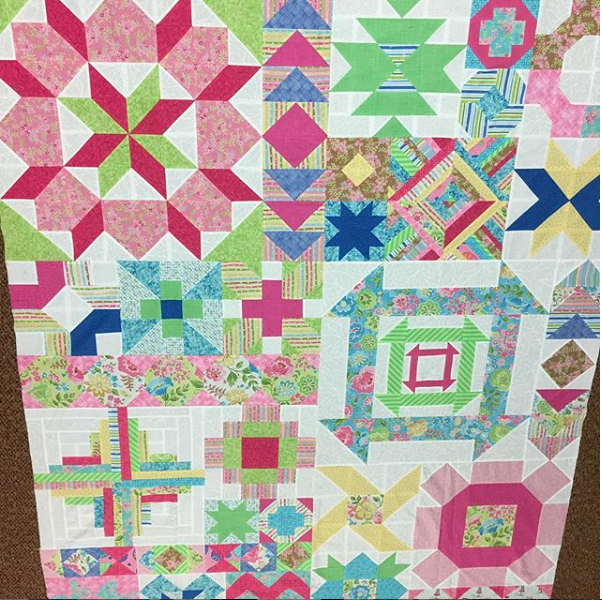 Linking from IG has been finicky lately, so check out a few quilts that have been emailed to me! These entries are numbered in the order they were sent to me, and following the LinkyTools numbers. Happy Needle and Thread Thursday, friends! Yes, I am still under orders to keep my sewing to a minimum, but I don't think that putting a binding on by machine is too much, do you? 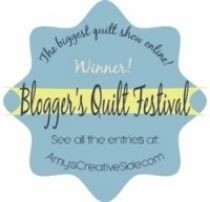 Ordinarily I quilt my own quilts, but Brooke at Lady Belle Fabrics has recently expanded her business to include longarm services, and offered to quilt this one for me so that I could let everyone know about her new venture. The offer actually came before I hurt my neck, but the timing was perfect- especially since this quilt is so large. 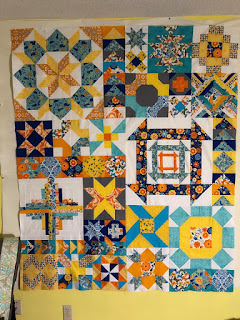 I really wanted this quilt finished before Christmas, and there is no way I could have done it on my own. 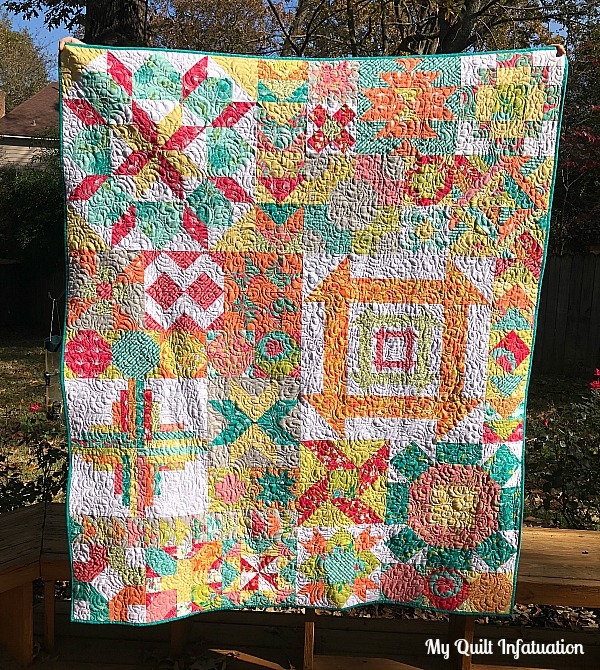 I chose the argyle quilting pattern, and I love the way it plays against the blocks. I asked for the pattern to be sized down so that the quilting was fairly dense, and it looks so good. The sunshine yesterday showed it off really well, and I'm so pleased with it! 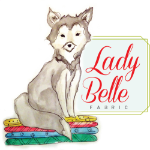 You can check out Lady Belle's quilting services HERE, or you can get to it with the tab on their main shop page. On the back, I used a larger green floral along with a tomato red polkadot, both from the Farmhouse II collection. And the solid red binding from the line frames everything nicely. This finished quilt is queen sized- 90" x 96", and will look amazing in my mother and father in laws' bedroom. I can't wait for them to see it in person! 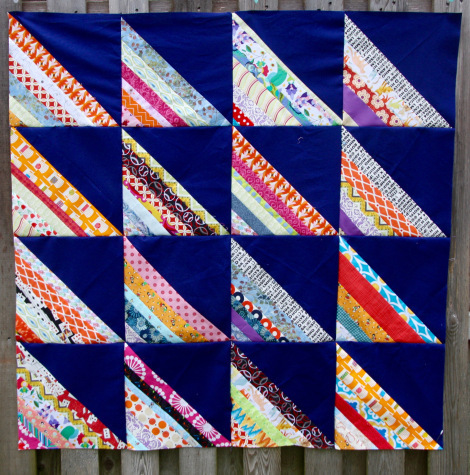 Sophie at Luna Lovequilts linked up this fun, modern baby quilt. 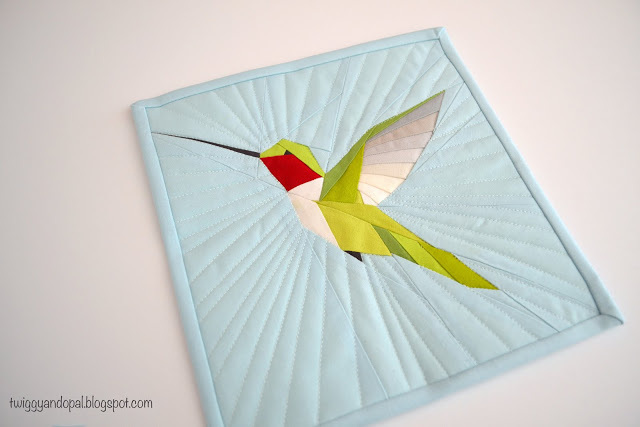 Jayne at Twiggy and Opal shared this little paper pieced hummingbird, called Sugar Baby. Love it! 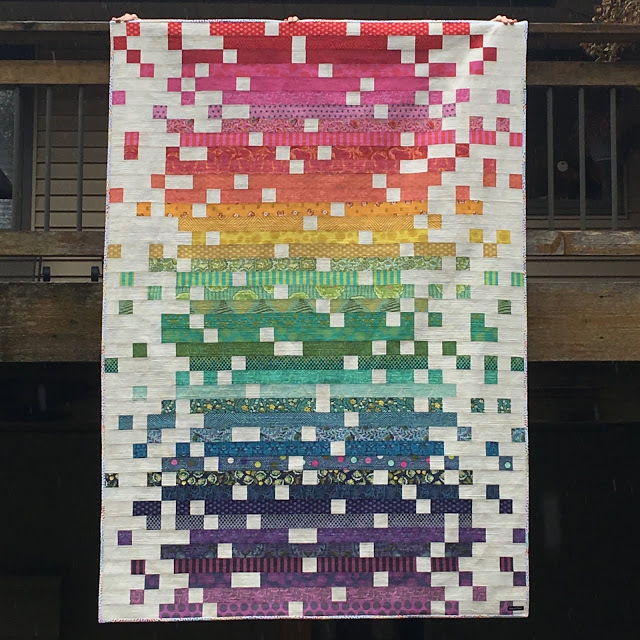 And Sew Preeti Quilts showed off her stunning Colorwash quilt. 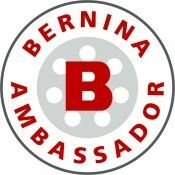 Her post has lots of close-ups, so check it out! WOW! Y'all are just awesome! I can't wait to see your projects this week. Let's party! Happy Needle and Thread Thursday! Well friends, I've been taking my doctor's advice to heart and resting my neck as much as possible, and other than making a binding for a quilt that is currently being longarmed, I didn't sew a single stitch this week. I do have something to share though. 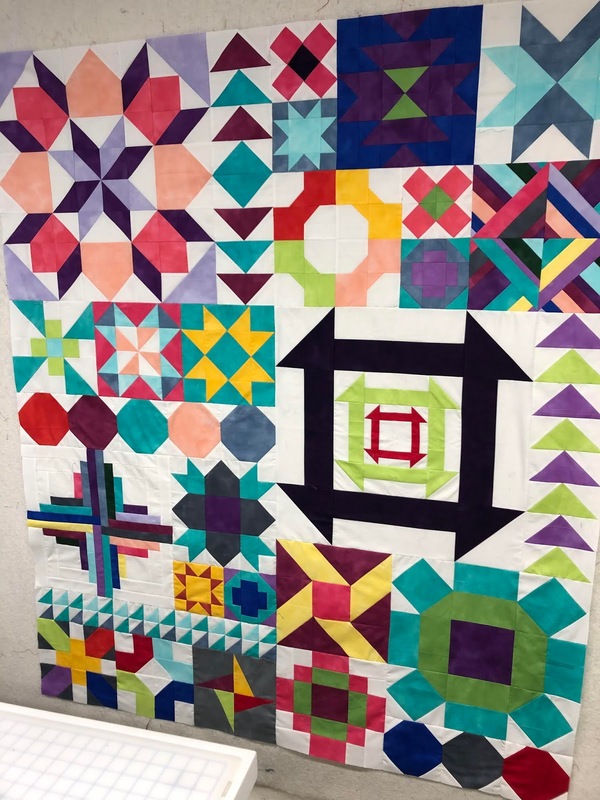 Take a look at this finished quilt, made by a student in one of my classes back in August (she is quilterinsearcy on Instagram). 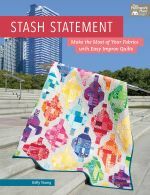 She used the Scattered pattern from Stash Statement, but customized it with her own color palette. Isn't it awesome? 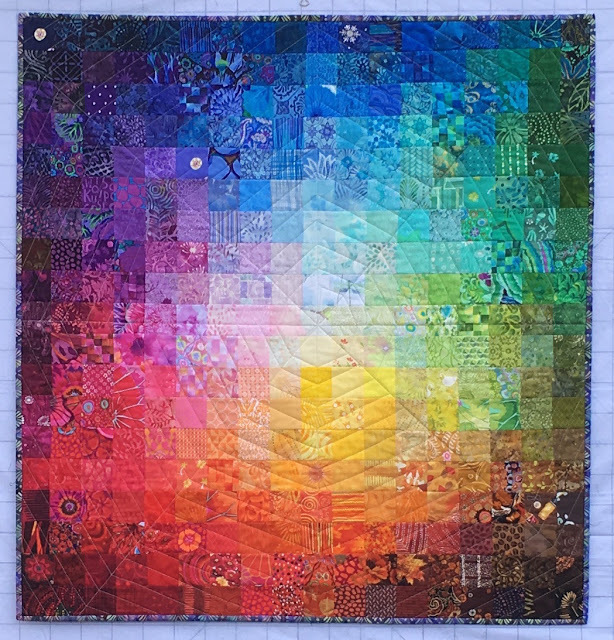 This quilt even won a blue ribbon in their local fair! I just love seeing finishes from my classes, and I especially love knowing that my students have fun with the technique. 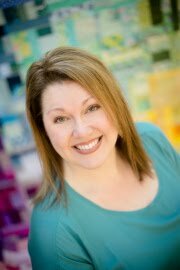 If your guild is looking for programming in 2019, I have just a couple of open months left. 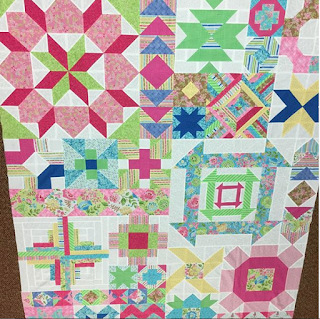 Contact me soon (email button on my right sidebar), and have fun learning how to turn your scraps into a one-of-a-kind masterpiece! Since I don't have any finishes of my own to share this week, I am delighted to share a few more highlights from last week's party than usual. And WOW! Y'all are really bringing it this holiday season. 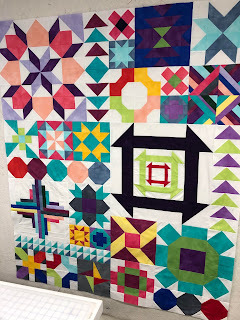 Nancy at Grace and Peace Quilting linked up this fun Party Quilt. 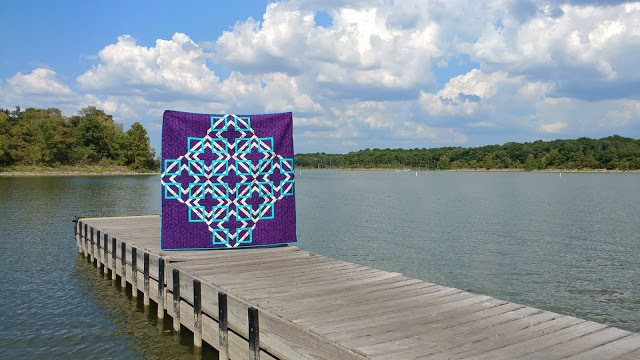 Kris at Sew Sunshine shared this beautiful improv mini, called River Walk. 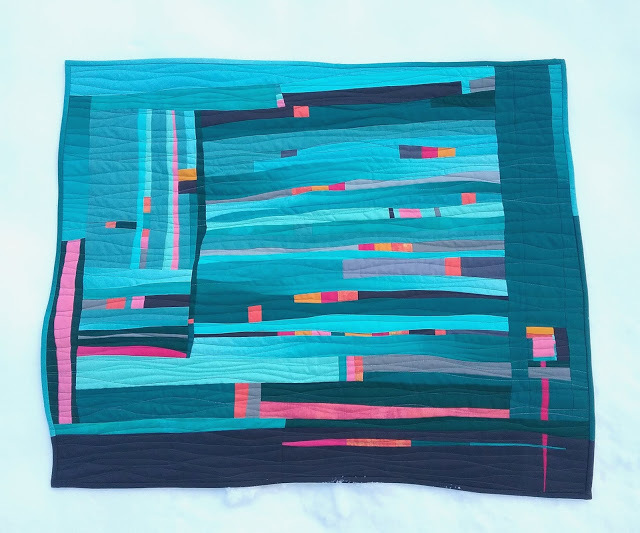 This quilt, called Turning Tiles is by Laura at Slice of Pi Quilts, and it is currently featured in McCall's Quilting! 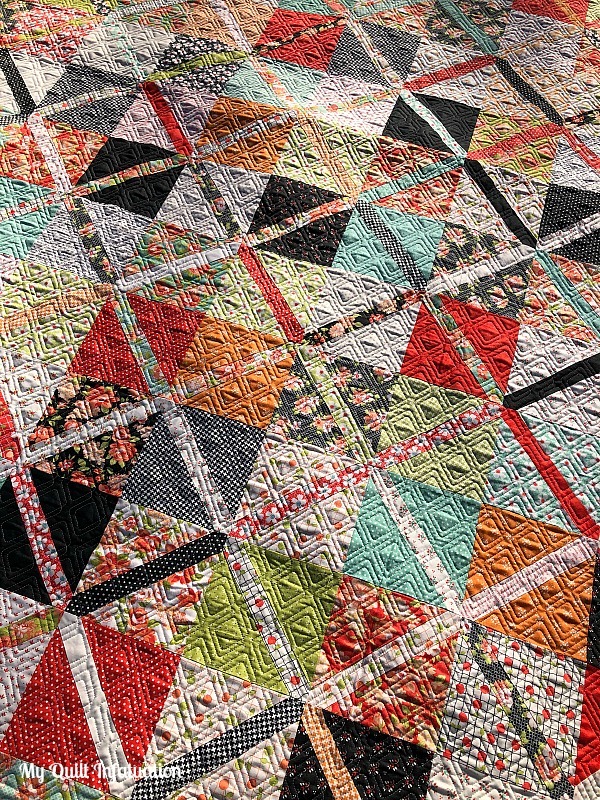 I love the scrappy goodness of this quilt by Nann at With Strings Attached. 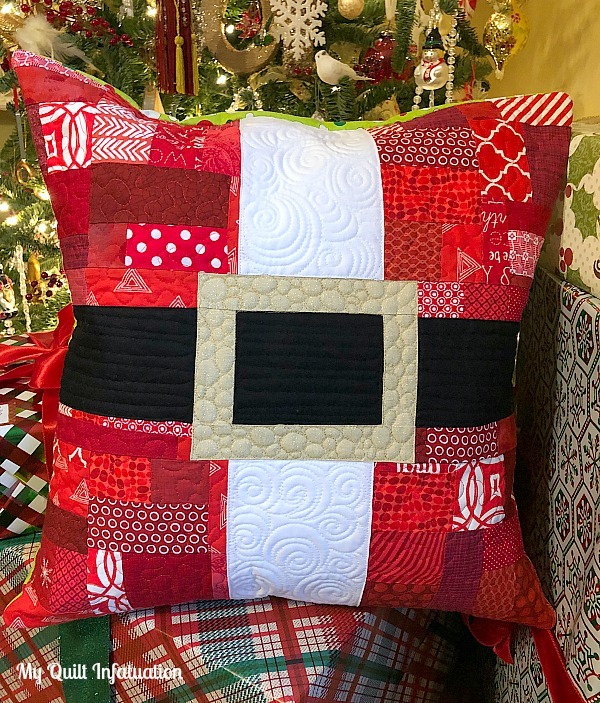 Vicki's Crafts and Quilting shared this fun Island Batik Christmas wreath quilt. 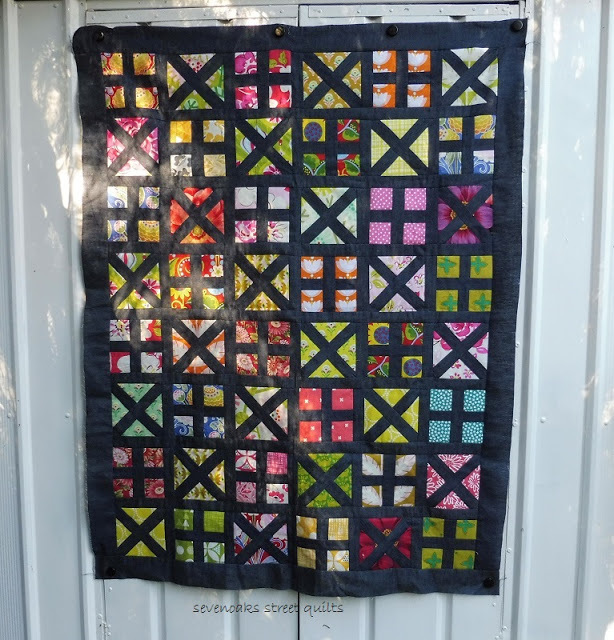 Check out this fantastic scrappy quilt by Cynthia at Quilting is More Fun Than Housework. These colors are so happy! 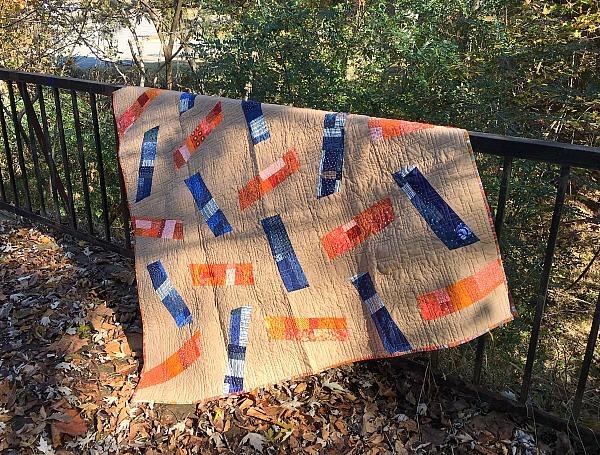 And finally, I cannot get over the awesomeness of this Flight Path quilt by Liz at Savor Every Stitch. 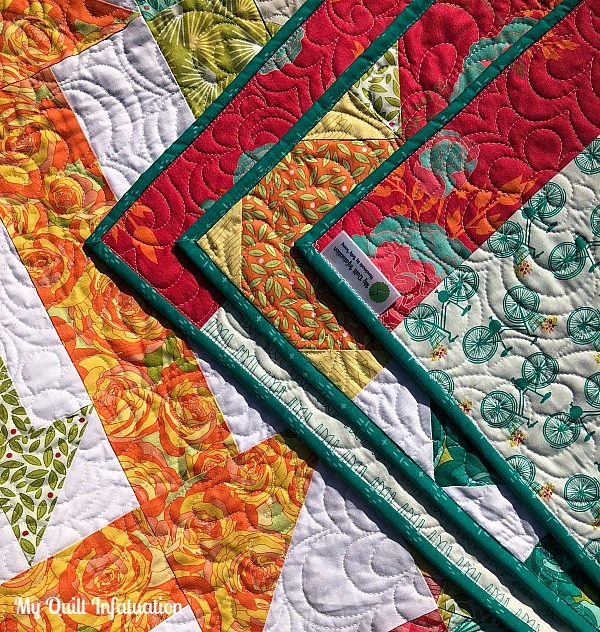 OMG- that quilting!!! Oh my goodness! I could easily have picked several more to showcase. Y'all are finishing the year strong, and I am loving all of the eye candy while I'm on my little hiatus. It's time to show off this week's projects. Let's link up!